Spectators gather daily to watch the changing of the guard at Buckingham Palace in London. On Friday, a military band paid tribute to Aretha Franklin at the ceremony. "In the Army Respect for others underpins all that we do, so there was only one tune that would do for today's ceremony: the 1967 Aretha Franklin hit 'R.E.S.P.E.C.T.,' a declaration from a strong confident woman who knows that she has everything." 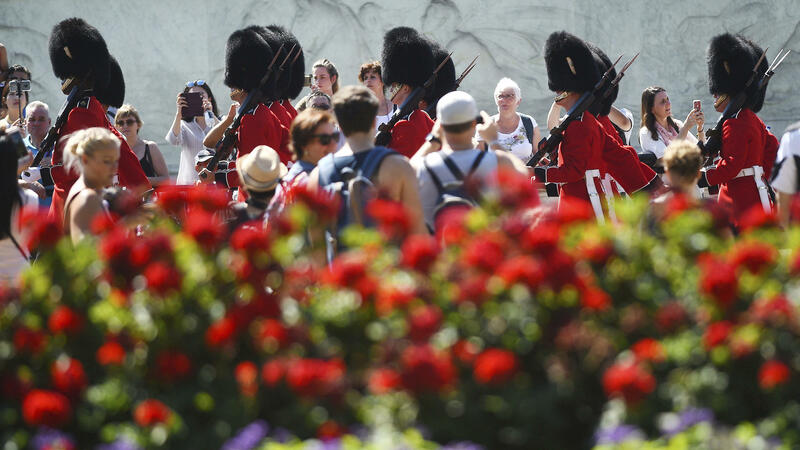 Spectators who gathered to watch the Coldstream Guards regiment perform the changing of the guard ceremony Friday morning cheered and applauded the song made famous by Franklin — whom the band called a "huge influence and inspiration to our musicians." Franklin's funeral in Detroit will include speeches from former President Bill Clinton, as well as civil rights leader Jesse Jackson, actress Cicely Tyson and others. Musicians performing at the ceremony include Stevie Wonder and Jennifer Hudson. You can stream audio and video of Aretha Franklin's funeral at NPR.org.